Ureter; Renal Agenesis; Pelvic Pain. Herlyn-Werner-Wunderlich (HWW) syndrome is part of a spectrum of Müllerian duct anomalies that occur during embryonic development. The syndrome is characterized by uterus didelphys, obstructed hemivagina, and ipsilateral renal agenesis. Only few cases of this disease were reported worldwide. We present a 23-year-old female patient with chronic pelvic pain for years. The patient was diagnosed with HWW syndrome with a history of hematocolpos and vaginoplasty at the age of 12. Five months later, she sought urgent medical care due to intense pain, and a clinical picture suggestive of peritoneal irritation. Clinical condition deteriorated and the patient underwent an exploratory laparotomy, which failed to identify anything to justify the abdominal pain. Uroculture and blood culture were negative. A magnetic resonance imaging showed a tube-shaped formations extending from the right retrovesical region to the mesogastrium corresponding to the persistence of the mesonephric duct, related to ipsilateral renal agenesis. The patient underwent laparoscopic procedure, identifying a right ureteric remnant blind ending, with distal and proximal obliteration, filled with purulent secretion, which was totally resected. This case differs from the other reported cases due to pelvic pain secondary to infection and abscess in ureteric remnant. We did not find any case with similar clinical presentation. The syndrome is characterized by uterus didelphys, obstructed hemivagina, and ipsilateral renal agenesis.2 Only around 270 cases of this disease were reported worldwide. 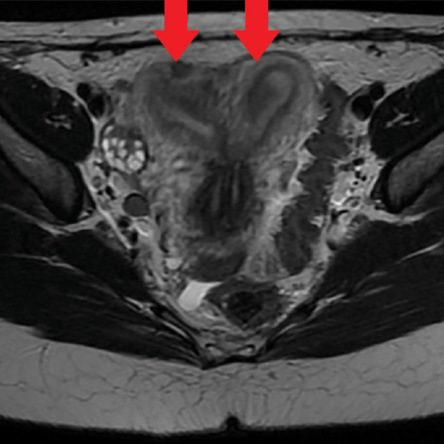 Imaging tests are relevant for adequate diagnosis, classification, and treatment.1 This case differs from the other reported cases due to pelvic pain secondary to infection and abscess in ureteric remnant. A search in the literature did not find any case with this clinical presentation. 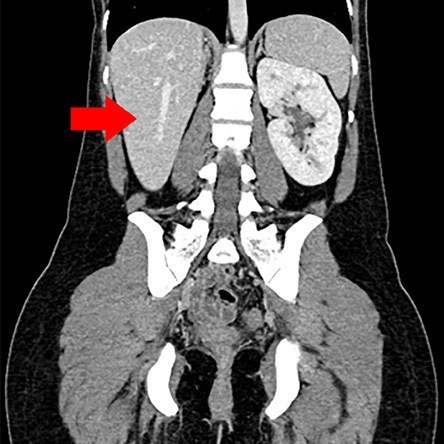 Figure 1: Computed tomography showing right renal agenesis (red arrow). Figure 2: Coronal view showing tube-shaped formations (red arrow) extending from the right retrovesical region to the mesogastrium, without any conveyance with the vesical lumen. Figure 3: Sagittal view showing tube-shaped formations (red arrow) extending from the right retrovesical region to the mesogastrium, without any conveyance with the vesical lumen. agenesis [Figures 2, 3, and 4]. 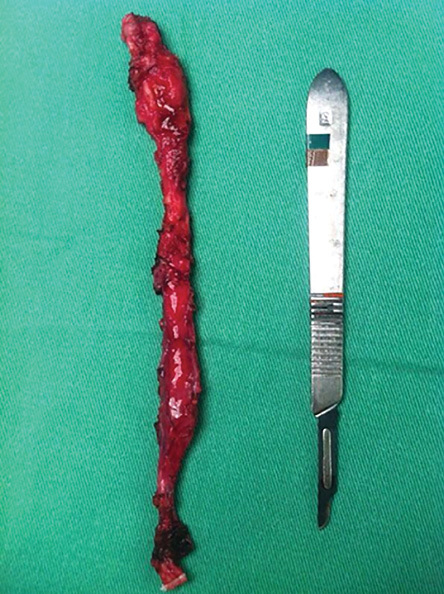 The patient underwent laparoscopic procedure, identifying a right ureteric remnant blind ending, with distal and proximal obliteration, filled with purulent secretion, which was totally resected [Figure 5]. The patient was discharged from the hospital a day after the surgery. Histopathology revealed a hydroureter without signs of malignancy and culture positive for Escherichia coli. A urethral catheter was used during surgery, which was removed prior to hospital discharge. The patient was clinically free of symptoms at 14 months after surgery. 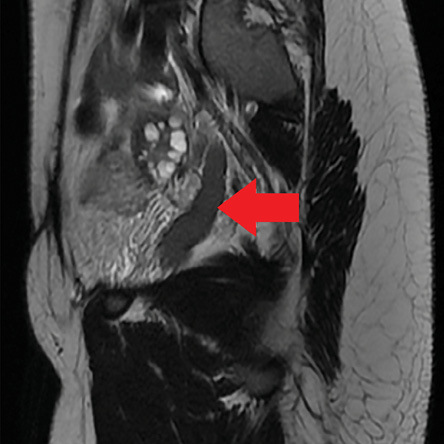 Figure 4: T2-weighted axial view showing uterus didelphys (red arrows). In this case report, the patient had already undergone surgery for correction of genital alterations related to the syndrome. Contrast-enhanced abdominal CT performed months ago have failed to identify any significant changes indicating the cause of the pain. Retrospectively, CT images were re-evaluated. An image of the right hydroureter was found, which was erroneously interpreted as hydrosalpinx in the first evaluation. Since clinical conditions characterized by acute or chronic pelvic pain associated with the syndrome were generally determined by complications related to the genital tract, the main diagnostic hypothesis was endometriosis at a later date, due to persistent pelvic pain. MRI was ordered for further evaluation. 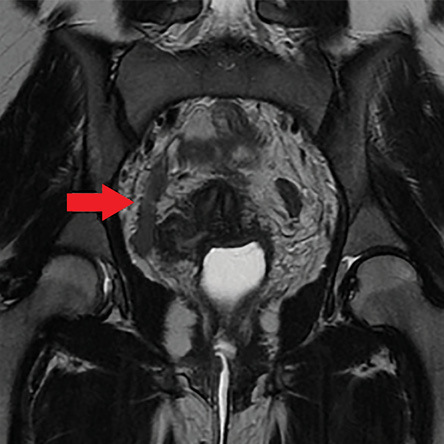 Alterations identified in the illustrated case alerted to the possibility of changes in the urinary system that may be pain triggers in this clinical scenario. Therefore, imaging studies of the urinary tract are fundamental in paramesonephric duct anomalies, particularly in the HWW syndrome. Up to the present, we failed to find any article in the literature reporting a case of HWW syndrome complicated by abscess in a ureteric remnant, which produced chronic pelvic pain. In this case, the ureter was removed and showed no signs of malignancy. The proximal third of the ureter was blind ending and the distal portion was atretic, preventing its drainage to the bladder and recognition by cystoscopy. Thus, appropriate diagnosis was critical for therapeutic planning and chronic pain resolution. 1. Chandler TM, Machan LS, Cooperberg PL, Harris AC, Chang SD. Mullerian duct anomalies: from diagnosis to intervention. Br J Radiol 2009 Dec;82(984):1034-1042. 2. Cox D, Ching BH. Herlyn-Werner-Wunderlich syndrome: a rare presentation with pyocolpos. J Radiol Case Rep 2012 Mar;6(3):9-15. 3. Bajaj SK, Misra R, Thukral BB, Gupta R. OHVIRA: Uterus didelphys, blind hemivagina and ipsilateral renal agenesis: Advantage MRI. J Hum Reprod Sci 2012 Jan;5(1):67-70. 4. Troiano RN, McCarthy SM. Mullerian duct anomalies: imaging and clinical issues. Radiology 2004 Oct;233(1):19-34. 5. Madureira AJ, Mariz CM, Bernardes JC, Ramos IM. Case 94: Uterus didelphys with obstructing hemivaginal septum and ipsilateral renal agenesis. Radiology 2006 May;239(2):602-606. 6. Aveiro AC, Miranda V, Cabral AJ, Nunes S, Paulo F, Freitas C. Herlyn–Werner–Wunderlich syndrome: a rare cause of pelvic pain in adolescent girls. BMJ Case Rep 2011; 2011: bcr0420114147.